My simple suggestion, after 12 games, the first to win 1 game wins the championship. Seirawan's idea is entertaining indeed, but cannot be taken too seriously. Gladly there are even more radical ways to determine a chess champion. One needs to mention for one, that never before in the history of chess has a drawn match of 24 games been an obstacle to determining who the world championship should be. The only way by which we can understand this incredible insistance upon the shorter matches is that it comes from immense pressure that does not probably originate from "chessic interests' only, from people who are concerned with continuing in a proper way the tradition of world chess matches a la classical way, but that it comes from an ideological point of view of capitalist profit that figures that shorter time controls makes the game more "exciting" and therefore one can have more publicity. However, those deluded, forget that chess is not a football or a Sumo match and that it was the long classical chess tradition that built the whole worldly stature of what a chess world championship represents. I am sorry to bring this in this manner, but who remembers what was the score of the Rapid Games of Ponomariov when he became world champion? Are we sure that Ponomariov should have been the world champion in 2002 for example? or all the "numerous" world championships that are "invented" all the time? In contrast to all the confusion that smaller time controls do when included in a classical match that spoils the game, one cannot forget 90% of the matches , their scores, games and relative importance , one at a time of all championship matches up to the 1972 Fischer-Spassky. These days most of the elite Grandmasters look at chess as a business, as a profession to live by, and many care more about ways to get money with selling their books, DVDs, tournament with huge prizes etc (which is totally understandable) than actually care about preserving the classical time championship 24 hours matches tradition, and many of those especially may feel they have no chance of winning it anyways. This is why a 24 games long match is one of the few sure ways that preserve Chess as an Art and preserves most of all a continuity with a tradition that has been going one for more than a century now. "To me, a much better idea would be to play the rapid and blitz tiebreaks FIRST. The classical match is then played as normal, but both players know throughout the match who will win in event of a tie, forcing a greater effort to play lively chess." Wouldn't that give the person who won the blitz match a powerful motive to quickly draw every game? At that level, I don't really see anyone being able to stop a top GM who's determined to keep the position dull and 100% drawish. There is no practical difference between Yasser's idea & just playing the 13th classical game with the challenger having white, & the champ draw odds. In the old 24-game system, 11.5 all after 23 made the final game Armageddon for challengers. Not an unreasonable edge for the champ in a system of now matches every two years. I like Seirawan's concern for having the proper time control for all games in the world championship. So we should maintain "classical" time controls for tie-break games. However, I also value the standard rules for winning and losing games, and the armageddon rules change that. One can lose if the game is drawn. But something has to give. My preference would be to, first, shorten the length of the games, but have them long enough to still be called "classical" and not "rapid." Perhaps 80 minutes could be the first time control. Second, I would either have the players play 2 game matches each day, where there would be no more rest days, until someone wins OR just have the players play games (two games a day) until someone wins a game. I dislike armageddon rules much more than I dislike shortening the game times. Why not play the tiebreaks BEFORE the "classical" match? It seems more fair: the final result is decided by classical play. If the loser of the tiebreaks can't win the "classical" match then he doesn't deserve to be crowned champion. Your idea (although it’s not new) seems to have several followers from the commentators here (so far Syuanjiang, Offramp, ChessTalk, KingDom64). But have you considered the negative effects too? 1. Tiebreak winner will play just to draw even more than how the most cautious player does today: at least today both players are supposed to play to avoid the tiebreak, and we have not a match where one plays to confirm a “tiebreak” and one fights to overturn it. In other words, the weight of such a tiebreak will become even more heavy than now, while Yasser Seirawan proposal is in the direction to downsize it, cancelling the spurious rapid and blitz games (and even so he is criticized by some commentators that giving Black with draw odds in a 13th classical game is a too heavy advantage). 2. If a player will underrate the importance of such a “starting tiebreak” (let’s suppose it’s a single blitz game and his thoughts will be like “I don’t care about it, I’m a classical chess player an I will do my best in classical games” or “I like this preliminary blitz game and I accept the result of it during, I don’t believe in those objections by that Chessbase commentator…”), and if he will lose the match because of it, be sure he will regret about it (or will swear at its result) more than he would have done playing the tiebreak after the ordinary match: for any high level classical chess player it’s better to regret about his own behaviour in the series of ordinary games which brought to an avoidable tiebreak, rather than about his approach in the first “tiebreak” game which brought to an “unavoidably biased” series of ordinary games. In other words, it’s better you read this last objection with the usual Yasser Seirawan’s sense of humor, if you’ll never want to conceive you could be the addressee of those loosers’s swear words. The challenger gets first 6 games as White. He needs to win one of them. Else he is lost. The defending champion then gets White for the next six games. He has to win at least same number of games. And he has to win them correspondingly earlier than the challenger. In case of a Tie, the defender would keep the title, but the challenger would get a rematch in 3 months or As soon as he could organize a sponsor. I am FM also MBA from Israel. ( I also had 1 GM norm). 1. First I want to say that I don't like shorter and shorter times control. I think also that in this match there was not enuogh times in the endgames. And so the standard of the endgames fall down a lot. In the world cup the knockout (KO) system is good and it make possible to take part for 132 players. But in WCC final match it is not right at all. 2. The Format that I offer: 12 games match with Classical time control' and as much times as possible. If the match is 6:6 then will be played another 2 Classical games with the same times control. The contender will get white in game 13 and black in game 14. So the contender will have 2 tries to win the match. I think people that want a Classical format would prefer as little Blitz as possible and that the match should end on a Classical game. What would be cool is a spectacle that begins with determination of draw odds with heavier emphasis on rapid rather than blitz. Then both players have a chance to recoup during the 12 or 18 Classical games. It doesn't matter if one person is better at rapids and blitz, it just much much better than giving the champion draw odds. I think determining draw odds would make the 12 games more interesting. No more dull chess because someone starts behind and has to take risks. Whats awful is how the 12th game ended up being a routine draw. Nobody could say that Armageddon determined the winner, only that they were very evenly matched. 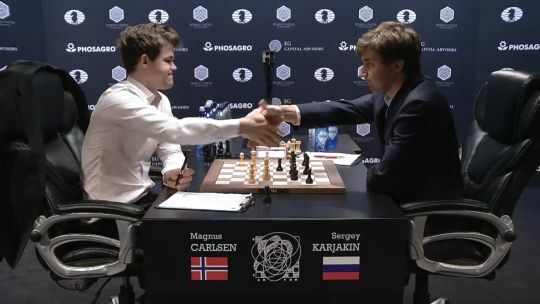 If Carlsen or Karjakin went into game twelve knowing that they would lose on a draw, they would try harder and take risks and provide us with a real game. I agree with GM Seirawan that change is needed. World Championship matches do NOT need to be settled by rapid and blitz. It is demeaning to the process. The old 24-game match, with the champion retaining title in event of a tie, was a good one, IMHO. Perhaps we could shorten it to 18 games. Some believe the champion has too much advantage in this system. I disagree. Compare this to another great one-on-one sport, boxing -- whose world championship, heavyweight division, dates back to the same decade as the 1886 Steinitz-Zukertort match. If I climb in the ring with the heavyweight champion and, at the end, the judges score it 118-118, it is declared a tie -- and the champion keeps his title. That makes perfect sense to me. You can't be champion unless you beat the current titleholder. It's as simple as that. The result will be compelling chess -- who can forget the excitement of the Fischer-Spassky, Karpov-Korchnoi and Kasparov-Karpov matches? We need that again! "Also, we have to decide: what is actually the problem with the current tie-break format?" In my opinion, there is not one, bur several problems. 1. Chess is about the games. World championship games are replayed a hundred years down the line. Blitz games, on the other hand, are throwaway. It is all about the result, who cares how it came about. That is, simply put, reducing chess to be a mere sport. Chess is much more than that. 2. Armageddon is not even sport. It is a lottery. 3. The mere existance of tie-breaks of short time control reduces the importance of the classical games. We see games with no conflict of interest and therefore no fight. This gets worse as the match comes to a close. When a "classical" format would have increasing tension, this format leads to a "drôle de guerre". Both players sit and wait. Because you can - the tie break is there. We have seen this before, most notably in the Candidates that led to Anand-Gelfand. Grischuk played no games. Draw as fast a you can, then on to blitz. Games to be forgotten, they are of absolutely no importance - all that remains are the results. We also see this in tournaments, where last round top board game fizzels out, to general disappointment or worse. Because nobody needs to win. The thing with world ch matches in classical format was that this never happened. One of the players would always have an incentive to try and win the last game played. Not so with tie breaks. There is always the lottery. I would highly suggest a 15 or 16 round because the more games is better for audience. Then I would favor the past format to be the challenger need to win more if he want to be next champion to promote more exciting games. Then if tie until last round, The World Champion will retain his title but the prize fund is split 40% to Champion and 60% to Challenger because he managed to tie. This will make win-win situation for Champion and Challenger. Only winner can get both.. the World Champion title and more cash than opponent . No Blitz or Rapid game as tiebreak. @ nbeqo : I don't agree with the fact that "Anand-Gelfand and Carlsen-Karjakin proved that classical chess is dead." In the first Kasparov - Karpov match (1984), there were a string of 14 consecutive draws, and another of 17 consecutive draws. Even going back so far as the 1927 Alekhine - Capablanca match, there was a string of 8 consecutive draws. And, therefore, I don't see at all why we would abandon Classical Chess. I quite like Rapid and Blitz chess, but could we imagine that, in twenty years, chess players would study Rapid or Blitz games of today ? The answer seems to me obvious... If we want to continue to have really memorable games, nothing can replace Classical Chess, in my opinion. Here is an even more radical solution. Make every game decisive. So, if the classical game for the day is drawn, then 3 blitz games are automatically scheduled to take place after that game. Best 2 out of 3 of the blitz games gets the 1 point score for the classical game. The blitz games don't account for any scoring points, they just figure out who gets the 1 point for the classical game. This does two things. First, it makes it so that players will try to avoid drawing lines and play sharper chess to avoid playing a blitz game for a critical point, and it makes it so that decisive games are always the outcome. No more boring ends to days because of draws. This means that every press conference after each day would have something fun to talk about. Think of the blitz games like a shootout in hockey. This might make chess exciting enough for more global press coverage. The champion must to win, must superate the current world champion if the challenger draws the match, the title has to be for the current world champion because that means that the challenger is not better than the actual champion and ofcourse the number of games should be more than twelve. Anand-Gelfand and Carlsen-Karjakin proved that classical chess is dead. 1 week match played for 4 days, Saturday - Wednesday, Tuesday off, 3 games a day with 5, 15, 30 min time control each, 5 and 10 min games in the morning and the 30 min game in the afternoon, in the end, if the score is even, a panel of arbiters will decide the winner (like they do in boxing). Draw odds with Black in a classical game with equal playing time is far too great an advantage for players at this level. This idea is suitable only for one of Chessbase's amusing fake posts on 1 April. However, the concept could work if Black's playing time was limited, though the amount of time is critical. One solution is for each player, prior to Game 1, to submit a bid for how much time they would want as Black. If Game 13 is needed, the player who bid lower gets Black and Draw odds and the amount of time that they bid while White gets the full time used in the first 12 games. This concept preserves most of the Classic time control, is completely fair to both players and adds considerable drama when Game 13 is needed. First of all, 12 classic games is too short; 16-24 games should be played. Second, I have a suggestion: we should let them to play rapid/blitz games first to determine the tie-break! Then play classic games, I am sure we will not see short draw in the last game! I think is better mixing blitz game and classical game, because playing first blitz game and then classical could favour too much one of the players, I want a good balance between the two format. For a chess player is very difficult change mind set. Both preparing for blitz game and classical at the same time will be much difficult, also the score and opening choice could eventually change faster. I think a simple solution is to have the tie-break match first, on a day before the 12 games begin. That way one player knows he will lose if the score is 6-6 after the twelve games. The incumbant must win the match to retain the title. That means - to remain World Champion you must actually BEAT the challenger. 18 games. Challanger should beat the Champ. Chess World Champion is an epic figure, the god of chess, like Fischer, Kasparov, Karpov .... to be remembered for centuries. Winning the title should be extremely hard and new Champ has to beat old one. It's not unfair, is the only way to stay forever. Chess World Champion is the god of chess and should be remembered for centuries. Not like champions that won a tournament like Ponomariov....good players winning a tournament. So world championship should be decided by a match with a challanger, like now. And the challanger, to win, should beat the world champion in an epic battle. 18 games and the champion retain the title with 9-9. A bit unfair but getting the title of Chess World Champion has to be extremely hard. Only way to be remembered forever. here is my radical solution. its actually emerges from the game of chess itself by having a slight advatage for the white. so here it goes. there are still 12 games. first let us understand that the champion is the "defender". so let us give him more black games to defend. let's say 3-4 more black games. if he is truly a worthy champion he should be able to defend his title with black odds in a classical game. the challenger should suppose to be better than the world champion if he is to become the champion. in that case he should be able to beat the champion at least with white odds. if not he is not a worthy world champion. may be he is not a worthy challenger as well, that i don't know. The best solution for me it´s INSERT BLITZ GAME BETWEEN CLASSIC GAME right from the start of the match!" Very nice suggestion. But I think the players should play the tiebreaks first instead of last. Then they will have to play hard throughout the match if they lose the tiebreaks...it will infuse some excitement into the classical games...no more dullsville. thanks for your essay and your proposal. I think it goes in the right direction. However, in my eye 7 white vs 6 white is too small a margin. (i) Both players propose the same number. Then a coin flip decides who gets the side with less White games. By such a procedure both players should be happy. This is by far the DUMBEST suggestion I have ever seen!! I agree that the current system isn't perfect, or even good. But this one?? Drawing odds?? This is a joke. To draw with black is much much easier. The point in armageddon game is that he has a one minute less so it makes sense but here?? Dumb as hell. "In your project, I think what could be an incentive, for the Champion, would be to let him have the same portion of the prize fund than the other players." "perhaps the ex-Candidates Tournament could be called : "World Championship Tournament", and the following match : "World Championship Match""
"And when I see something that I approve or disapprove on a ChessBase article, I try to comment on it quickly, because after, no one (or nearly no one) reads or writes anything under it"
I know. :) Like I said, I should've checked back on it at the time, but have been surprisingly busy myself, for this time of the year. "If you want to divide a cake fairly, one person should cut it, and the other person will pick his piece. That way neither will have a bigger piece." "this must be done at the beginning of the match. one guy gets 7 whites and the other gets 6 whites. the one with 7 whites has to win the match and the one with 6 whites will be announced the winner if the match ends 6.5-6.5." Again, this would put whoever gets 7 whites at a clear disadvantage, no matter by what means it's determined who that is. Good one GM Y Seirawan. Couldn't believe you can still make brilliancies at this time. This could easily be part of "Winning ..." Chess book series. Again there is somebody's lucky number 13!!! I like the idea very much and would suggest 2 slight modifications: the match should go over 17 games. The Champion will get black in the last game automatically, independent who starts the match with which colour. Restdays after 4 games. If the match is tied, the champion keeps his title. @ PGMatthews : For me, it is exactly the opposite. The fact that, in chess, there are more than 50 % of draws at a high level, in classical games, means that each win has a real value. If every game ends itself in a win for one or the other player, a win doesn't really mean anything anymore ; the slightest difference will convert itself into a win. While in chess, with the high percentage of draws, when a player wins, it means that he really had to battle to come out of the "draw zone". So, for me, chess isn't at all, as you said, " the game of how not to lose", but quite the opposite : the game of how to really win ; to win, and to fully deserve it. Agree entirely that it is totally inappropriate for the classical world champion to be determined by non-classical games. However, I have no issue with the old rule of "drawn match world champ keeps title". Sure, it's a significant advantage, but I like the idea that a challenger has to beat the champ to take his throne. But make it 16 games... 12 is too short, especially with the arrangement I suggest. this must be done at the beginning of the match. one guy gets 7 whites and the other gets 6 whites. the one with 7 whites has to win the match and the one with 6 whites will be announced the winner if the match ends 6.5-6.5. Great suggestion! FIDE should seriously consider it. Like it. Whatever you propose somebody will find a flaw, but rarely propose something different and/or better. We have Rapid Play and Blitz champions. This proposal is as good as it gets for me. The alternative is the champion retains his/her title in the event of a tie. Something simple and keeping the match classical. ssdsnd - Solution: All classical games in Fischer random format. I agree with Seirawan that the World Championship decided in rapid is not a good format. The proposal would certainly be an improvement over the current situation, but I think that since the World Champion is the king of chess, the challenger should play in a way that the World Champion is actually challenged. So the World Champion should retain his title in case of a tie. The challenger therefore would need to win more than the World Champion, which would motivate him to play fighting chess. If the challenger has more points, then the World Champion would be on the verge of losing his title and therefore he will be the one motivated to play fighting chess. If all games are drawn, so be it, the Champion retains. If you want to divide a cake fairly, one person should cut it, and the other person will pick his piece. That way neither will have a bigger piece. Same in a chess match: after 12 games, one player should set the clocks to whatever times he wants (as long as the total time makes it a classical game), and he should also set the rule on who wins the match in case of a draw. Then the other player chooses which side, black or white, he plays.